I've got Planet Solaris in my RSS reader, as you probably see some of the content from there in the semi-frequent Delicious Links RSS entries (or on the sidebar). I also follow a few of the Planet Solaris folks on twitter. As such, I read a lot about OpenSolaris. I've tried it before, in a Parallels VM on my MacBook, but never really gave it a go of things on a decent desktop system until tonight. The system I'm using isn't wired, so I was pleased to see that OpenSolaris picked up my USB WiFi adapter and had no problems connecting to my encrypted network (although there's that network manager annoyance where you, for some reason, have to type in your network key TWICE). I'm currently running it in Live CD mode, and it's pretty responsive. Granted, I'm running it on 2GB of RAM, so that probably helps a great deal. When I get a chance to swap out hard drives, I'll likely install it permanently to see how it goes. 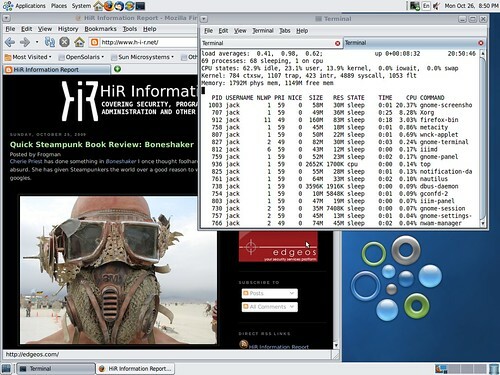 Daily, I use Solaris, AIX, Windows XP, and Linux. The gnome desktop environment within OpenSolaris is familiar, with a very Ubuntu-inspired default configuration. It's certainly much different than my Solaris 10 "Java Desktop" interface at the office. The default theme is pretty slick, and doesn't make me want to search for ways to cast out the demons of angry fruit salad. I'll have another update in a while after I settle in with OpenSolaris a little more.